USC students can now securely and privately create a record of unwanted sexual contact or sexual assault. Save, match it, or report it. You choose. Callisto provides three distinct options for survivors of sexual assault. Record information about what happened securely and privately. It won’t go anywhere if you don’t want it to. Enter perpetrator information so we can identify repeat offenders within your school community. Report electronically to USC so they get your full account of what happened before you even walk in the door. It was hard to imagine coming forward in an immediately public way, but to start by chronicling what had occurred would have been a helpful and important first step. Callisto ensures that you have the information and options that you need to make the decision that is right for you. We use identifiers of perpetrators such as Facebook, Twitter, Instagram, phone number, and/or email to match. 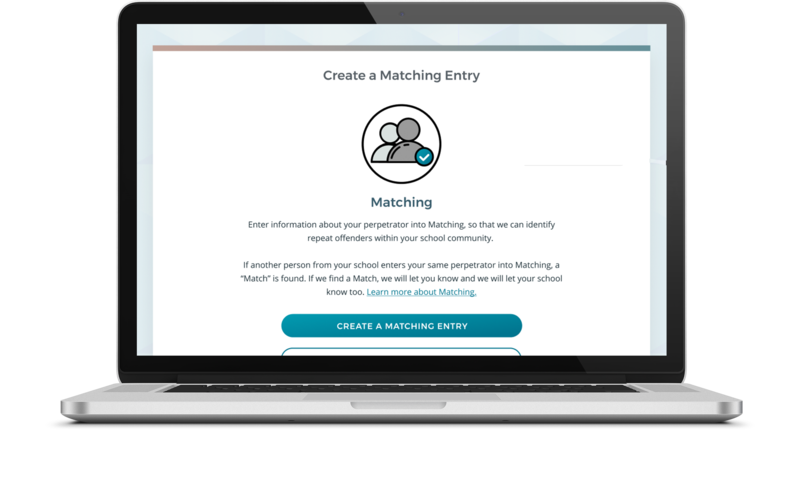 If the perpetrator identifiers you submit match another student’s submission, both students’ information will be sent to the school. Complete the record at your own pace; access your record whenever you are ready to continue the process. Statistics show that you are not alone. 1 in 5 women, 1 in 13 men, and 1 in 4 trans or gender non-conforming students are sexually assaulted while in college. 85% of assaults are committed by an acquaintance, friend, or romantic partner. Repeat perpetrators commit 90% of sexual assaults. Here are some of the things other students have said about Callisto. "It seemed sensitive to the fact that this would be traumatic. I liked that you could keep working on something in steps and not have to complete it all at once." "It allows someone to record their incident under complete privacy — that way they can report their case whenever they are comfortable with it, and don’t have to worry about forgetting details that later on may be important." Learn what to expect in the process of reporting, who can use Callisto, and how you can help a friend. Callisto gives you the options, information, and resources to make the decision that's right for you.